This year a growing number of smokers will turn to e-cigarettes to help them quit smoking. But recent studies indicate that e-cigarettes may actually make it harder to kick the habit, while masking several other serious health hazards. Take a look! The Stryker Rejuvenate hip replacement device has been linked to an increased risk of metal poisoning (metallosis). Although the Stryker Rejuvenate is not a metal-on-metal hip device, it has metal-on-metal components, which are believed to be responsible for the development of metallosis in some patients. According to reports, the Stryker Rejuvenate hip implant is linked to a high early failure rate, resulting in some patients having to undergo revision surgery. E-cigarette use among teens tripled from 2013 to 2014, alarming health officials. The new year often brings new beginnings. Resolutions to lose weight, save more money or finally start that big home improvement project may be high on your list. Many of us will also resolve to quit smoking, and some will turn to e-cigarettes as a way to stop gradually. But do they deliver as promised? Before you use e-cigarettes as a way to lower your tobacco use or stop smoking, You Should Know about the hidden dangers associated with this increasingly popular product. Teenage use of e-cigarettes has tripled in recent years, making e-cigarettes more popular now among teens than traditional cigarettes. The CDC warns that nicotine use in teens can harm brain development. There are over 500 different brands of e-cigarettes, with 7,700 flavors of nicotine liquid. None of these brands or liquids are regulated by the FDA. Sales in the U.S. e-cigarette industry will grow by a projected 25 percent per year through 2018 and may surpass traditional tobacco cigarette sales in 10 years. Seventy-five percent of people who use e-cigarettes practice dual use by also smoking traditional cigarettes instead of using them as a way to stop smoking. View video. 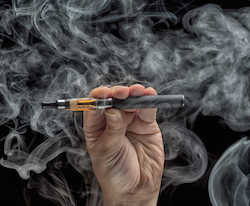 A recent Harvard study shows the presence of harmful chemicals in many e-cigarette flavors. View video. The FAA has issued a warning that the lithium-ion batteries found in e-cigarettes can pose a fire hazard in cargo holds of airplanes. View video. A new report documents the impact of litigation on the investigation of concussions in professional sports and sports at all levels. Forced arbitration is a growing threat to the safety and legal rights of all Americans, says Julia Duncan, director of federal programs for the American Association for Justice. You Should Know is a copyrighted publication of Voice2News, LLC, and is made possible by the attorney shown above. This newsletter is intended for the interest of past and present clients and other friends of this lawyer. It is not intended as a substitute for specific legal advice. If you no longer wish to receive these emails, click here to unsubscribe from this newsletter, and your request will be honored immediately. You may also submit your request in writing to: Steven L. Miller, Editor, 4907 Woodland Ave., Des Moines, IA 50312. Be sure to include your email address.